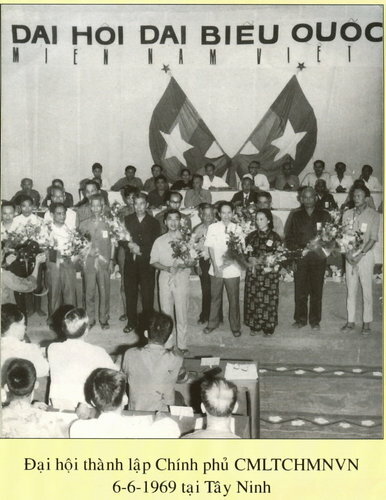 The NLF of Vietnam (Vietcong) adopted a horizontally red over blue flag with a yellow star in the centre. This flag was that of the (communist) Republic of South Vietnam, adopted on 8 June 1969. It became the only flag of South Vietnam between 30 April 1975 (when the anti-communist regime collapsed) until 2 July 1975 (when North and South Vietnam were united as the Socialist Republic of Vietnam). Ratio 2.3. The "Vietcong" flag was simply a Communist flag with a blue half. The blue half quickly dissolved on 1 May 1975 (not 2 July 1975), at the "reunification speech" of Le Duan, then Communist Party's Secretary General, in Saigon. Even founding members of the NLF (e.g. Nguyễn Hô) now admit that they were simply Communist Vietnam (North Vietnam) with a different flag. Nguyễn Hô is now under house arrest for revealing these secrets. I have heard a story (probably apocryphal, but who's to say?) that the Vietcong flag indicated unified control (the gold star) over the communist north and capitalist south (red and blue). Once the south was also communist, there was no further need for the blue on the flag. Anyone else know anything about that one? Yes, you're probably right. The official meaning of the blue stripe of the "Vietcong" flag (or that of the "Republic of South Vietnam" - don't confuse with the Republic of Vietnam, a yellow, three-striped flag!) is "still unliberated area", i.e. the capitalist South. After "liberation" (to remain politically correct, I'll not comment this term) and especially after unification of "both states," the blue color logically disappeared. The drawing [at top of this page] of the Viet Cong flag shows a small centered yellow star on a red and blue striped background. But take a look at the flag we captured (and I mean "we," as I was there). The flag had large white star on the center, as in the drawing I made. I am sure there were variants, but I know this one was real. I have a National Liberation front flag (Viet Cong) with added 3-inch black horizontal stripe on red color. What does the black signify? As a Vietnam veteran I saw very few actual VC flags like the one shown at the top of this page. This was because they were all hand-made, one-of-a-kind flags. For example, during my tour we captured a VC flag with large white star on a red-blue vertical field, and one with a large yellow star with a red-white vertical striped field. These are both shown on my website. My point is that every VC unit used their own variants of the "official" National Liberation Front flag and chances are that yours is one of these. However, if the black stripe has special significance I look forward to learning what it is. An interesting story about this Viet Cong Flag was that it probably is the only flag ever captured by a hovering helicopter in a combat zone. In 1969, the flag was snatched by a helicopter crew about 100 yards from Firebase Barbara by the door gunner as the helicopter hovered above the flag left on a pole by Viet Cong soldiers. Fearing the flag to be booby trapped, the helicopter crew first exploded a hand grenade near the flag before swooping down to grab it. The pilot was Warrant Officer Harry Oberg of the First Brigade, First Air Calvary, stationed near Tay Ninh, Vietnam. Apparently, some people will do anything to get a souvenir flag. The photo has a caption which reveals that it was taken in Tay Ninh, on 6 June 1969. It also shows the flag of the Alliance of National Democratic and Peaceful Forces of Vietnam, which was briefly mentioned in the text as well. Note that the stars on both flags are the same as on the 1945-1955 flag of North Vietnam. At several websites of Vietnamese diaspora, the pages dealing with the battle of Hue, and more specifically with the Hue Massacre, the mass killings perpetrated during the Communist hold of the city of Hue during the Tet Offensive in early 1968, are illustrated with the image of a blue-red-blue vertical flag with a yellow star on the red field. All of these pages attribute the flag to the Alliance of National Democratic and Peaceful Forces of Vietnam, which had actually been founded after the Battle of Hue was over, and say that it was hoisted at the Hue Citadel during the occupation of the city by the Viet Cong and North Vietnamese forces. The repeating erroneous attribution of the flag suggests that all these pages might be actually citing the same source, which still does not necessarily exclude the flag's existence, but it should be attributed to Viet Cong instead of the Alliance of National Democratic and Peaceful Forces of Vietnam, just like the red-white-red horizontal flag with a yellow star on white field, which was also reported to have been used in Hue at the same time. The flag of the Alliance of National Democratic and Peaceful Forces of Viet Nam must have been inspired by these earlier designs, though. The flag also would end up being used by both the ANDPFVN and the Viet Cong as well.